In its third and final form, the combat system of The Bureau: XCOM Declassified plays an awful lot like Mass Effect. It's a third-person shooter where you point a pair of squadmates around levels that are dense with cover, and a handful of its character abilities are pulled straight from Commander Shepard's playbook. There's a Lift power that levitates enemies. There's a radial wave attack that bucks aliens out of cover. There are powers that sap an enemy's protective armor or shield, and a Squad Heal ability. 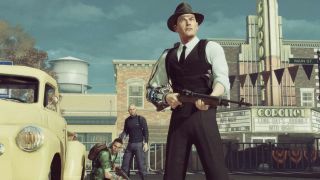 When I played The Bureau: XCOM Declassified a couple weeks ago, I asked 2K's producers on the project about the thinking behind the combat. The answer I got was scripted and disappointing. What were your inspirations for the combat system? Nico Bihary, Senior Producer: Well, a lot of the inspiration comes from the XCOM franchise. There's a lot of... did you play Enemy Unknown? Bihary: So you probably saw a lot of the similarities through the combat, you know—as I'm moving my guy into cover, it shows me the half-shield or full shield, or if I'm moving a guy into bad cover it'll tell me where he's gonna get hit from. And there's also weapon types: laser, plasma, and human. And there's kind of a progressive rank on how advanced the weaponry gets and how good you are. So those ties are definitely very obvious as far as the combat system goes. Andrew Dutra, Associate Producer: The core XCOM experience was a big influence on how things were formatted and how things were displayed. Wouldn't you say it's fair to say that there are a lot of parallels to Mass Effect, in terms of the combat style? Dutra: I mean, yeah, we've seen people comment about that, and it's great, Mass Effect is a great game. Our game's a great game. What would you identify as differences between Mass Effect's combat style and your combat style? Dutra: So with our game, you have more control over where your agents go, you have more control over where they're placed on the battlefield, versus “you just do an ability here, you just do an ability there.” So there's more strategy involved behind that. And also the whole consequence of, “My guy's gonna be lost, I can't use him anymore” certainly ratchets up the difficulty there. Bihary: We certainly push the consequence a lot, which we don't think anyone has really done in this third-person shooter scenario. Dutra: Which, again, is an XCOM core principle. It's easy to call 2K's XCOM shooter a copycat. But I don't consider that rhetoric a useful exercise—innovation can happen through iteration, and you could make the argument that it's clever of 2K to rely on players' familiarity with a widely-played series. William Carter is responding to a distress call in a small neighborhood, a cul-de-sac smorgasbord of Leave It To Beaver homes. He exits his vehicle in the street with two fellow agents--AI-controlled comrades in ties and hats, each wielding a pump-action shotgun. It's perfectly silent. A children's bicycle lies toppled in the road. He makes his way through a backyard--an idling lawnmower in half-cut grass is the first evidence of something amiss. A few feet away on the patio, there's a dead man smothered in blue-black oil, a grease that paints a trail into the house. “I've seen this before,” says a nameless agent, kneeling to inspect the body. “But it doesn't get any easier.” Carter snaps a photo of the body with his camera and moves inside.